The past few posts have had way too much writing and not enough pretty pictures. Seriously, this isn't a blog of deep thoughts, at least not yet. 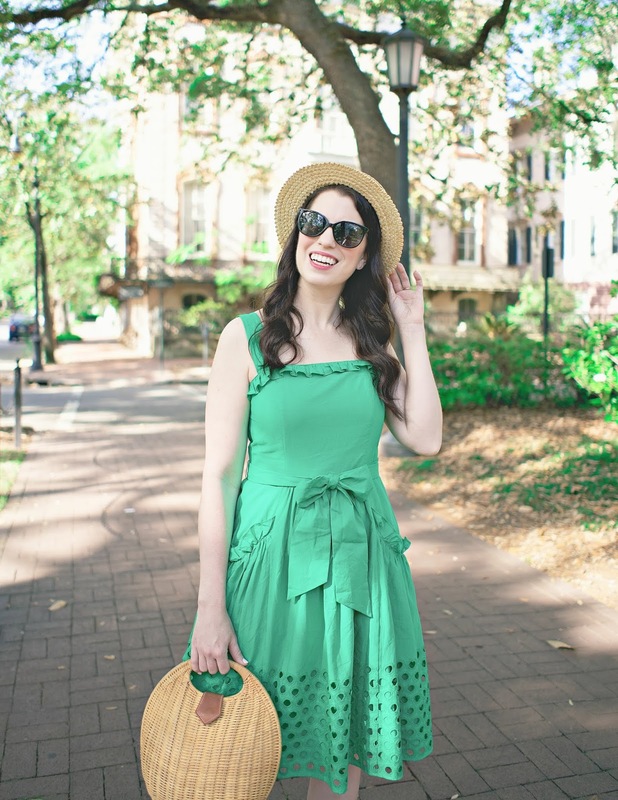 This is a blog of pretty, yummy things. Lately I have been extremely fiscally responsible, aside from the occasional bottle of nail polish I've only been spending my money on work related things. And it is driving me crazy. 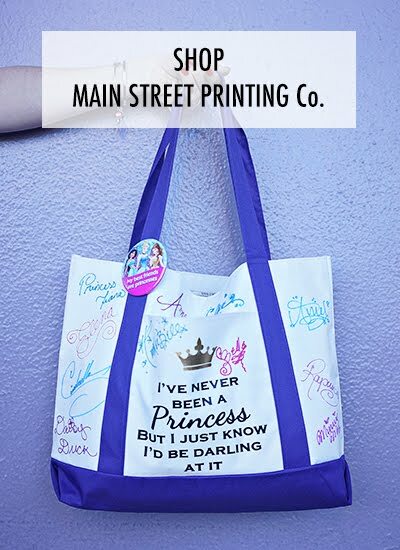 I think I'm about to burst and go on a major shopping rampage. But that would be irresponsible! So I'm not going to do it!...I hope. I've procrastinated on doing anything about decorating our apartment because we were hoping to move in the next few months, but now that's starting to look a bit iffy, so I think I'm going to put the effort and money in to make things a little bit more homey. I'm going to start with the bathroom, since as the smallest room it should be easiest and cheapest, right? And let's be honest, we all spend a lot of time there anyway. After my Kraken Rum shower curtain debacle I've decided perhaps steampunk is not the way to go, and I'm just going to go with the oh so traditional beach undersea theme that is so popular with bathrooms. If you haven't noticed, I'm mildly obsessed with themed rooms, I'm not sure why. This Anthropologie shower curtain is super pretty (and girlie, which Tony is not a fan of, but too bad) and also ridiculously expensive coming in around $118. However, there are a million tutorials on pinterest for replicating it, so maybe I'll give one of them a shot once I have some more time on my hands. 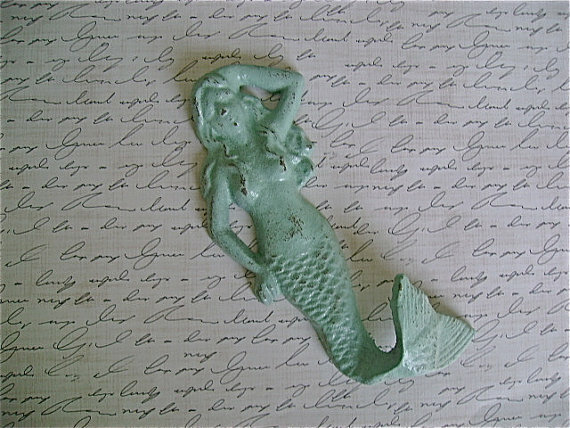 And is this not the cutest little mermaid towel hook ever? I think so! 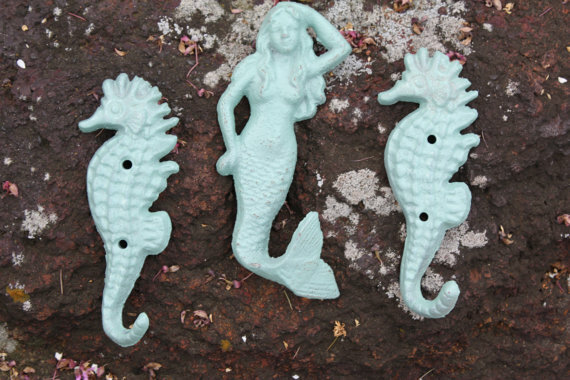 Or maybe I should do the mermaid and seahorse set? This beach glass set is cute but I think it might be taking the blue/beach theme a little too far. Especially since our sink is already shaped like a shell (this is no doing of mine). I also think I'm going to need a part time job at Pottery barn. 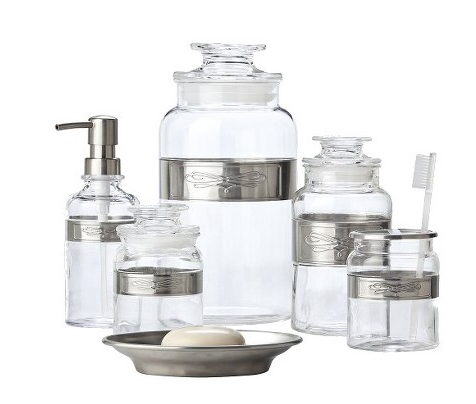 I'd say that this set is the one that I want to go with, but it doesn't have a toothbrush holder (which I would use for makeup brushes, because that is the best idea ever!) 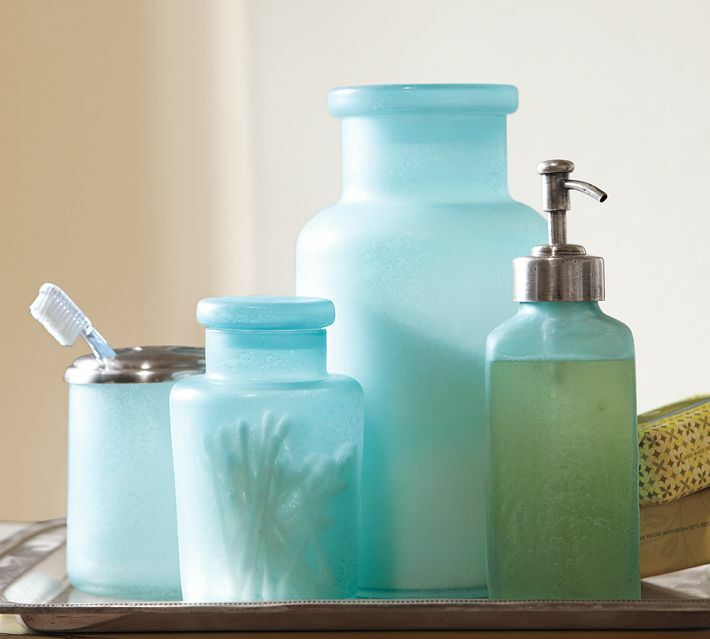 and what's the point of buying a bath accessories set if they don't match? You can't have 3 that are identical and one odd man out. That's totally not cool. This one might be the winner, no toothbrush holder but it has a tray. Or maybe it's too beachy once again? 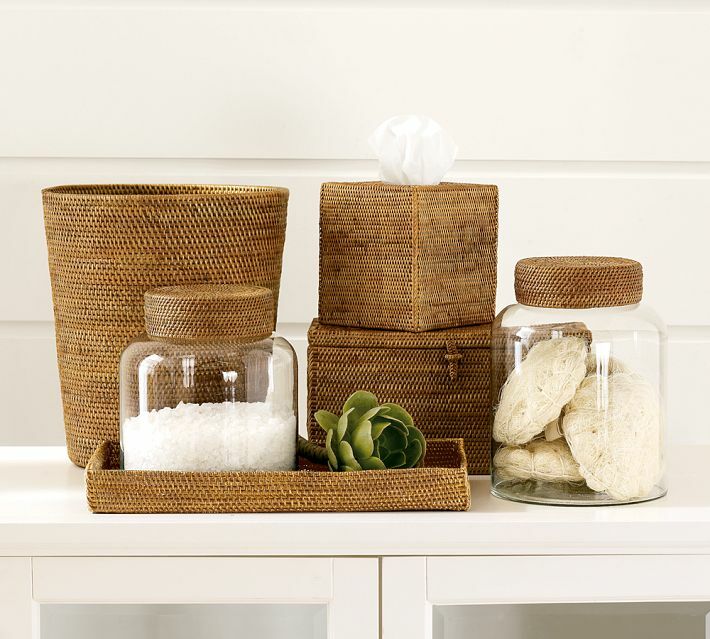 Or maybe I should kill myself if I ever seriously consider buying a $60 wastebasket for my bathroom? Life is so hard when you're procrastinating from doing your real work by picking out bath accessory sets that you can't afford in real life! Besides, we all know I really do my shopping at Walmart and Target. Ah yes, this is more my price range...and even that's questionable, since I generally prefer to buy things for $.59 at the Salvation Army. And of course, I need some bathroom art. Except my bathroom has no windows and generally no ventilation, so anything that's going to go in there is going to be destroyed by condensation almost immediately, so it needs to be as cheap as possible...or maybe some metal wall art that isn't going to disintegrate in the moisture? 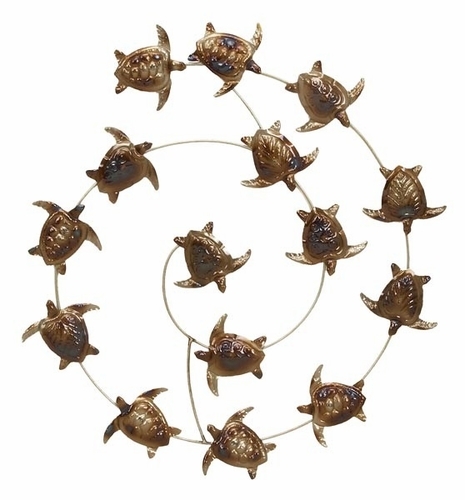 By the way, that's called "Samba of the Sea Turtles" which is *awesome* I think I'm taking this beach thing too far. 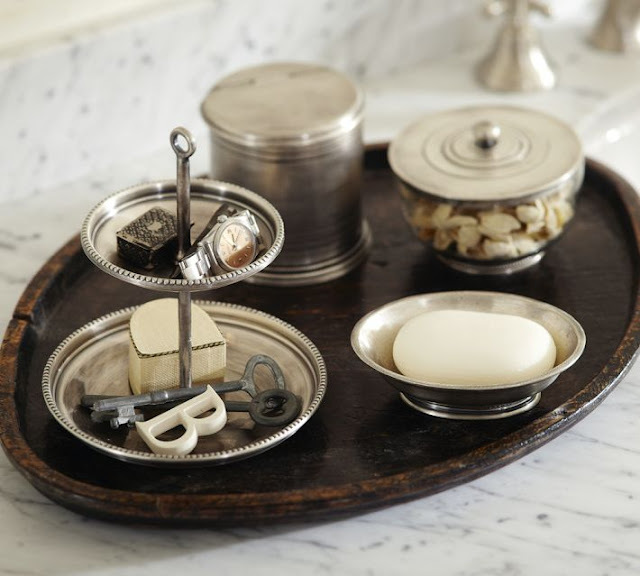 Perhaps a shelf with a sea shell on it will suffice. When this actually happens (probably never, because I'm all talk no show), I'll be sure to post some poorly lit pictures. 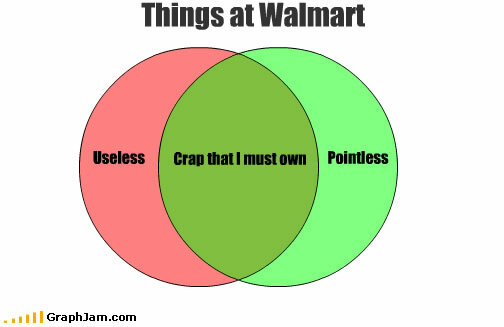 The Wal-Mart graph completely cracked me up!! I can't wait to re-do our bathrooms when we close on our house in July. 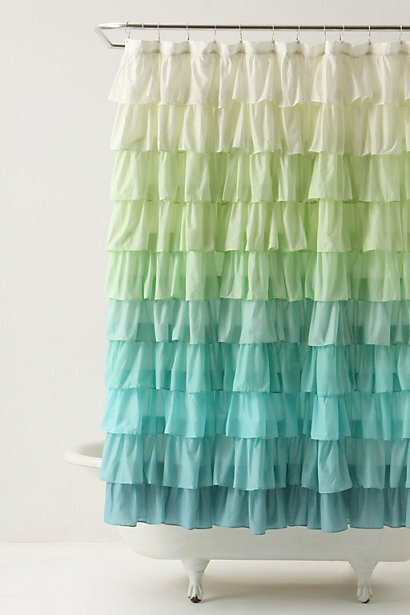 I loooooooove the ruffly shower curtain. I've been real into "Shabby Chic" from Target. Yes, I'm a Target shopper. Probably sad, but it's a cute line. Reminds me a lot of the design you featured. Much more affordable. have you checked Target for shower curtains? Their "Shabby Chic" line is really nice. also, you might wanna check on Ebay.. search for shabby chic shower curtain. lot's of good deals!